We scoured through the plans from some of the top broadband service providers in India ranging from Airtel, BSNL, Hathaway and more to find the plan that offers the best bang for the buck. 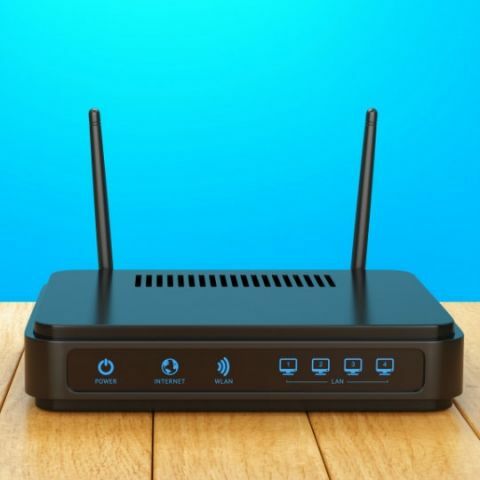 Here are the best broadband plans money can buy. A broadband internet connection at home is a must. Cheaper overall plans, unlimited data offers and the fact that you can hook up your Smart TV or game console to one. But there are so many different broadband providers out there, not to mention the myriad of plans they have on offer. Don’t worry, we’ve gone through some of the most popular broadband providers in the country and sorted out some of the best plans that you should consider opting for. One interesting this we noted was that the Plans priced between Rs 1,000 to Rs 1,500 usually offered the best value. It should also be noted that the prices of the various plans as well as what they offer can vary greatly depending on the circle. So it’s always a very good idea to check the prices and details of the plans in your area. Also, there is also a possibility that there may be a relatively unknown local service provider who may be offering good plans. So without further ado, here are some of the best plans you can get from various broadband service providers. Keep in mind that Reliance Jio’s plans are not on this list as their broadband services are not yet live officially. Airtel broadband is present in almost all parts of the country and is currently offering a range of high speed plans. Further, the company is currently running an offer in which it is offering free data ranging from 500GB to 1000GB till March 2018. 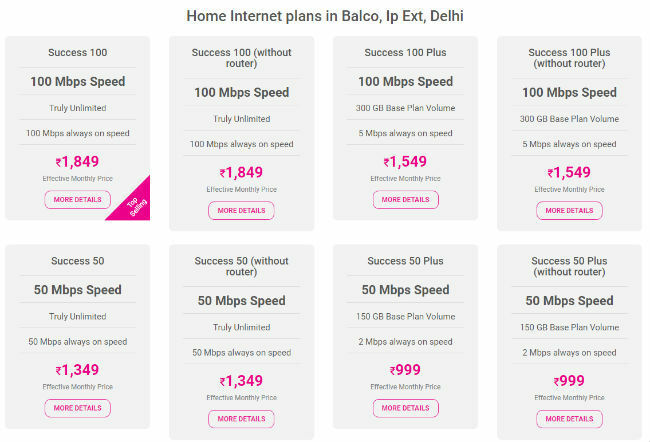 One of their most interesting plans is the one that costs just over Rs 1,000 and offers 40Mbps of broadband speed with an FUP of about 90GB. The exact details of this plan vary from city to city. In Delhi, the Rs 1,099 plan offer an FUP of 90GB and 1000GB of additional data. In Chennai, the same price offers an FUP of 130GB, but with 750GB of additional data. In details of the plan in Mumbai are the same as those in Delhi, however, the plan is priced at Rs 1,199. 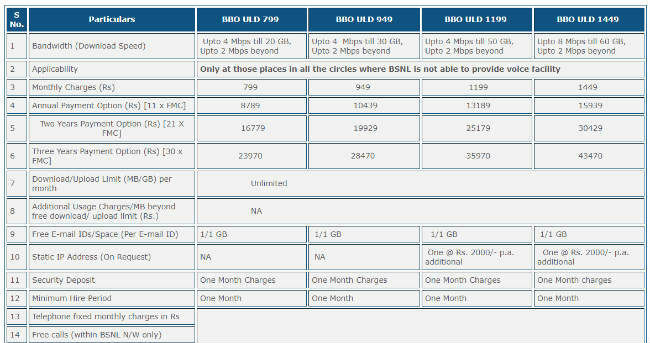 State-owned BSNL also offers a wide range of plans on offer that can be quite confusing to be honest. Unlike Airtel, most of the plans will offer around 4Mbps to 8Mbps of speed, although there are plans that offer upto 24Mbps . However, you do get unlimited download plans with no limit save for a speed drop after a set cap. The ‘BBG Combo ULD 1199’ plan is priced at Rs 1,199 offers upto 4Mbps of speed till 40GB after which the speed would drop to 2Mbps. But this plan also gives you free unlimited calling to any network (if you still use a landline that is). If you can pay a little more, check out the ‘BBG Combo ULD 1441’ plan that is priced at Rs 1,441 and offers 8Mbps speeds till 40GB, after which the speeds would drop to 2Mbps. No free landline calls with this plan though. 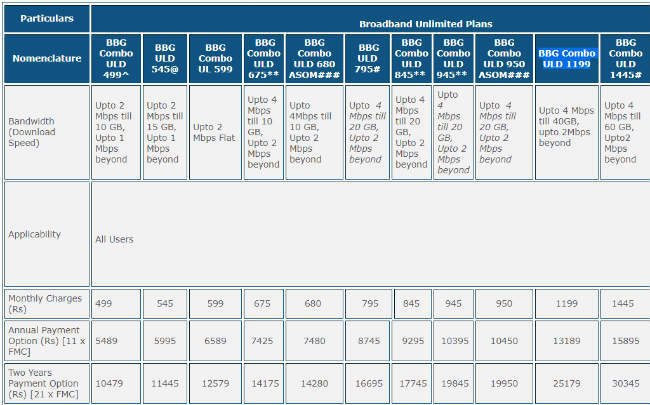 However, for the princely sum of Rs 8 more, check out the ‘BBO ULD 1449’ plan that is pretty much the same as the previous plan, but offers a cap of 60GB instead of 40GB. The only drawback (if you can call it that) is that you do not get a landline connection. Gasp! 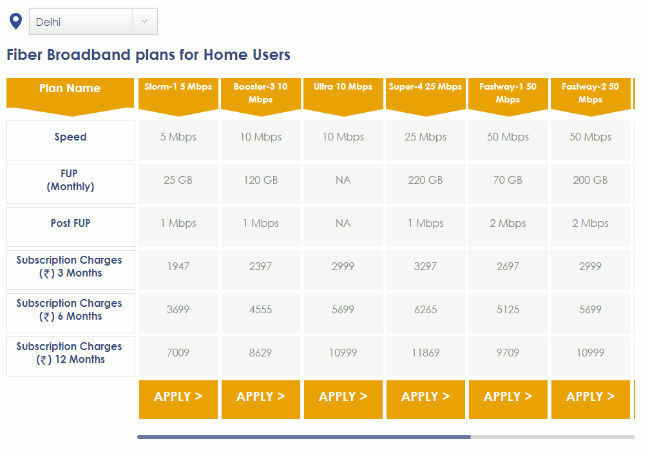 BSNL also offers Fibre-to-the-home (FTTH) plans that range from 20Mbps to 1000Mbps. But these are priced quite high. These plans are unlimited with prices ranging from Rs 3,999 to Rs 16,999 per month. Also, the speeds will drop down to 2Mbps after a certain download cap is reached. If you are strapped for cash, you could try their ‘Experience Unlimited Broadband 249’ plan that offers 2Mbps speeds till 5GB and 1Mbps beyond that. However, the plan is only valid for a year,after which users will be shifted to the ‘BBG Combo ULD 499’ plan. Hathway isn’t as widespread as Airtel or BSNL, but it does offer some pretty decent plans. One of the most interesting things about Hathway is that the plans are quarterly. So you play for three months in one go. Like Airtel, Hathway’s plans can change a lot depending on where you are. One of the more interesting plans we noticed was for around Rs 2,999 for three months. In Chennai, you can get about 150Mbps till 1000GB, after which the speeds will drop to 5Mbps. In Mumbai, you’ll get 50Mbps speeds till 100GB, afterwhich the speeds will drop to 2Mbps. In Delhi you can choose between two options for the same price. You can either get 50Mbps speeds with a FUP of 200GB and 2Mbps speeds post that, or you can get 10Mbps with no FUP. Take your pick. 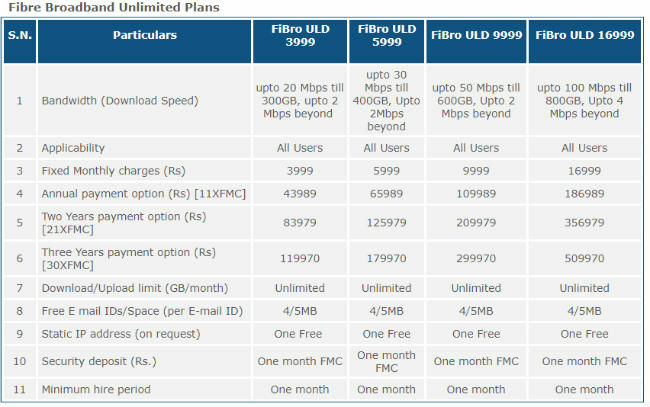 Reliance Communication seems to have a very limited number of plans as compared to other on this list. And their speeds are also not up to par. 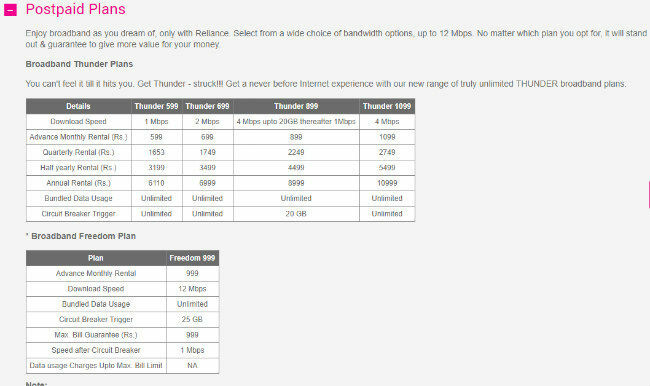 Its ‘Thunder 1099’ plan is priced at Rs 1,099 per month, and offers 4Mbps speeds with no limits. There are a bunch of other service providers that also seem to be offering pretty interesting plans, but they are currently limited to a select few cities and areas. Spectranet covers a pretty limited area, but offers 100Mbps unlimited plans for about Rs 1,849 a month. 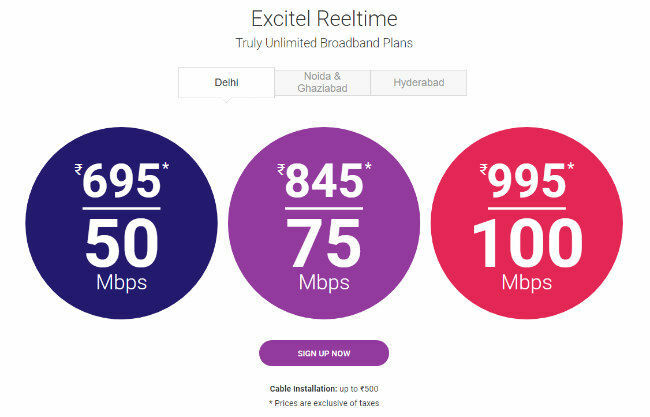 Excitel is comparatively cheaper and offers a 100Mbps connection at Rs 995. But it’s only currently available in Delhi, Noida, Ghaziabad and Hyderabad. ACT is another provider with a limited coverage and generally offers speeds ranging from 15Mbps to 100Mbps. 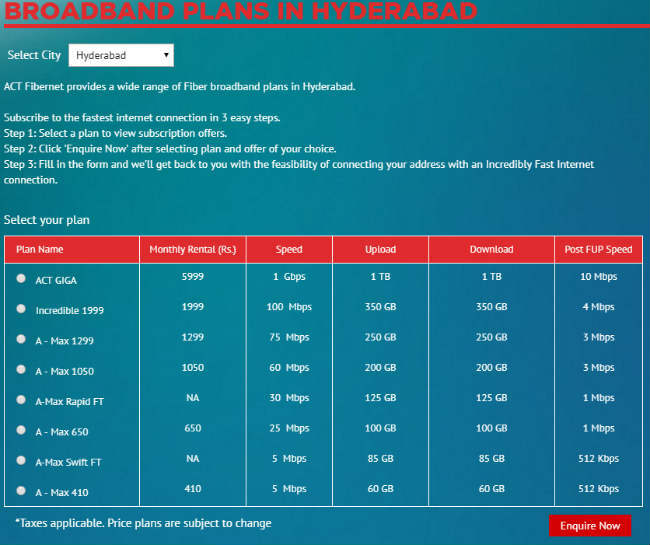 But if you live in Hyderabad and have the cash to spend, you could check out their ‘ACT GIGA’ plan that costs Rs 5,999. What do you get for that amount? Well, you get a 1Gbps connection with a limited of 1TB, afterwhich the speeds will drop down to 10Mbps. The plus side is that you’ll be able to watch Netflix in 4K on four TVs at once… and still have bandwidth to spare! Which broadband provide best internet speed Airtel , Idea, Vodafone or Tata Docomo ?